Over the weekend, gun rights supporters flooded Democratic legislator’s townhall events to express their extreme dissatisfaction with recent bills aimed at limiting gun rights. As Bill Clinton tried to warn Democrats, gun rights supporters are a passionate bunch who care deeply about the Second Amendment — a group that includes a significant amount of people who would otherwise vote Democrat in rural areas. Democrats haven’t listened, but maybe this weekend’s massive turnout might make them think twice. An estimated 750 people turned out Saturday to tell a local state politician how they felt about gun control. State Sen. Angela Giron heard from vocal and animated constituents. The town hall was scheduled to discuss four gun-control bills the Colorado House passed last week. Those bills will be heading to the state Senate for a vote in the coming weeks. The freshly minted state representative supported a measure passed by the House calling for background checks on private sales of firearms. Democrat McLachlan, a former Marine who served in Vietnam, and Republican state Sen. Ellen Roberts were at the library for a “Legislative Lowdown” sponsored by the La Plata County League of Women Voters. 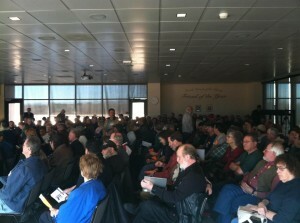 At least 400 people attended the event, with standing room only overflowing into the foyer outside the meeting room. GRAND JUNCTION, Colo. – A crowd of hundreds gathered in Grand Junction to voice opposition to pending gun control legislation. Gun owners from around Mesa County hope to send lawmakers a message to both Washington and Denver, urging them to stay away from their guns. DENVER — Hundreds turned out at the Capitol Saturday to take a stand against four gun bills making their way through the Colorado legislature. There hasn’t been an issue in the Colorado Legislature that has galvanized such passionate and broad-based support and crowds across the state like this in many years. Democrats would do well to pay attention. Governor Hickenlooper probably wishes the whole thing would just go away. "An armed society is a POLITE society" However huge the dichotomy of law abiding gun owners is, or how they vary in opinions– one thing is certain, they respect each other, cause they know their actions have legal and moral consequences. I took a fishing trip to Alaska in 2004. On my way to Seward, we stopped to eat breakfast. 80% of the customers had a gun either on the hip or laying on the table. Not hidden. I thought to myself, If anybody got stupid and tried to pull some shots off, How far would they get? This is good news, but I'm pretty sure that the left-wing loons in control of Colorado government will do what they want anyway. Shawn Rosvold , what I find disturbing is you're attempting to discuss an issue when you don't even know the basic facts and design features of the item you're attempting to "control". The fact that the current legislation is targeting things that have an unmeasurable statistical impact on firearms related violence should be of concern to us all. If you really want to impact firearms related violence, "assualt weapons" and magazines are not the reall issue. Until you understand that and can factually discuss the issue, you come across as nothing more than a frightend person trying to hide from the scary thing in the movies. Valarie Murphy Gun-freezones: Nineteen of the 43 incidents (44%) between January 2009 and January 2013 took place in private residences. Of the 23 incidents in public spaces, at least 9 took place where concealed guns could be lawfully carried. All told, no more than 14 of the shootings (33%) took place in public spaces that were so-gun-free zones. Dave Gill You can choose to believe the polls or not, but they're all consistent. The majority of Americans want stricter gun controls. Shawn Rosvold, those mass shootings all happened in gun-free zones. Recall elections are probably in order. And how biased was the way in which the questions were asked and by what percentage were the inner cities over sampled? Michael Tate – I don't know where you found that poll, I can't find it. But here's what I found. These numbers are consistent with every poll I've seen on the issue. Half of Americans say it's more important to control gun ownership, compared to 46 percent who place more importance on protecting the right of Americans to own guns. That 4-point difference follows 6- and 7-point margins in favor of gun control in late December and in January, and marks the most enduring swing toward such measures since 2008 in Pew's polling. Support for specific proposals also has remained steady. Background checks on gun sales are favored by 83 percent of Americans, and bans on assault style weapons and high-capacity clips by 56 and 53 percent respectively; all three figures are comparable to those from mid-January polls. Yeah Shawn, "sane gun laws" are to ban black rifles, those with pistol grips, flash hider, and other cosmetics! That's not 'sane', that's stupid!. We could help stop another Newton or Aurora and then some! But you Liberals loons are hindering our ability to defend ourselves by your gunfire zones and your stupid gun laws! There is a current problem that the ruling class (the few) think they know better than the country class (the people). I think that is one of the reasons the founders stood up back in the day. Shawn actually anti-gun is in the minority. According to a Gallup poll ( from Feb. 7-10), 42% of Americans approve of Obama's gun policies while 54% disapprove. Colorado is currently passing those same gun policies. We need to fix the problem but it is not the tool it is the person. Why did not Colorado abide by the intent of the Brady Bill and report the disturbed man up-line. He would have been stopped from buying the weapon he used. An armed liberal, hahaha. Those who preserve our rights are, will be, and always have been anti liberal. Does gun control have a prayer in Colorado? I have a bad feeling that we won't have gun control until right-wingers fear the wrath of armed liberals. No matter how many people show up, you're still in the minority. Instead of fighting sane gun laws, why don't you try to help stop another Newtown or Aurora? Oh, sorry, I forgot who I was talking to for a second. Carry on pushing the hot buttons! See ya at the polls!